Skype for Business Response Groups route and queue incoming calls to designated persons, known as agents. You can increase the use of telephone support services and reduce the overhead of running these services by using Skype for Business Response Group Statistics Performance Map. The SfB Response Group Statistics Performance Map available in MAF ICIMS™ gives clear visibility of Skype for Business Response Group performance ensuring Skype for Business Call Handling times are acceptable and resources have been allocated accordingly. From the MAF ICIMS™ search box the required Skype for Business Response Group is easily selected. Once a Skype for Business Response Group has been chosen the required date range is selected, the first map shows an overview of the Skype for Business Response Groups performance. To view individual call details presented to the Skype for Business Response Group, select the required call from the Skype for Business Response Group Summary Reporting Map. All agents in the Skype for Business Response Group presented with the call are shown on the chart. Skype for Business Response Group Call queue time and Skype for Business Response Group talk duration are displayed, colour coded. An overview of the Skype for Business Response Group call details can also be seen. If Skype for Business Response Group call quality details are required, it is possible to open the Skype for Business Response Group Call Detail Monitor by clicking on the required part of the Skype for Business Response Group Call Summary chart. More about Skype for Business Monitoring, Analytics, Reporting and Recording. More about Skype for Business System Monitors and Response Group Call Detail Monitor. 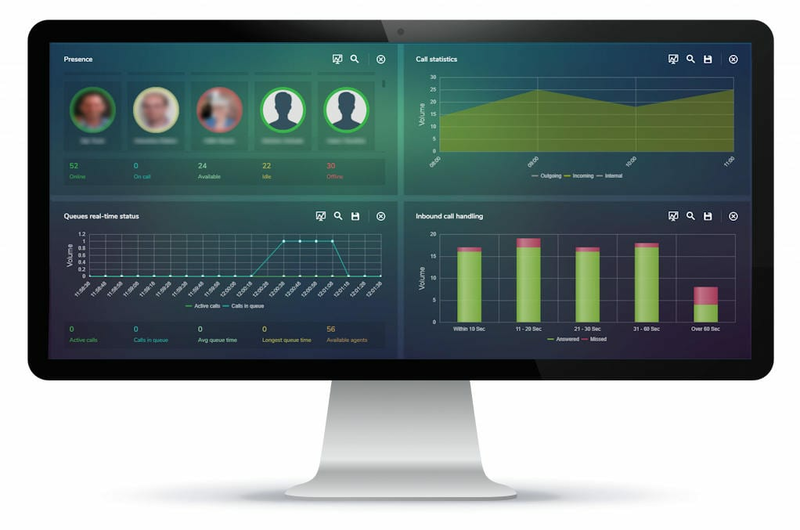 More about Real Time Wallboards and Reporting for Skype for Business Response Groups & Presence. Questions about the MAF ICIMS™ Response Group Statistics Performance Map for Skype for Business? Call us at +3172-8200205 of mail info@mafinfo.com our salesteam is ready for you. Skype for Business (Lync) Response Group Reporting, SfB Response Group Reports, Skype for Business Response Group Statistics; S4B Response Group Performance, Skype for Business Response Group Analytics, Skype for Business Response Monitoring, SfB Response Group Missed Calls.